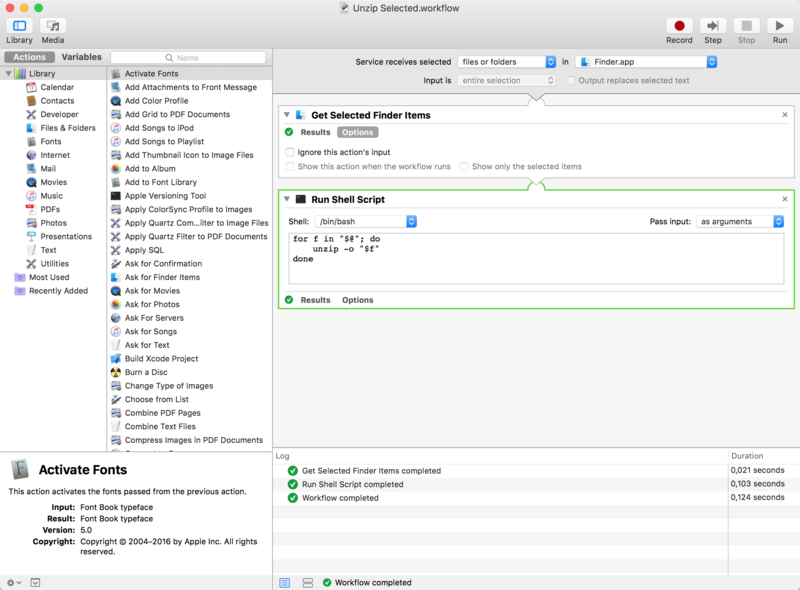 I am creating Automator Service to unzip selected files in the same folder they are located. How can I get selected file absolute path in Automator, so I can pass it into my shell script ? As you can see I am only passing filename for now, but its not unzipping in same folder. I would like to change folder before unzip, and then execute unzip. I tried cd ~ but it unzips to my homefolder. I would like to unzip in same folder as selected files exists. Add cd "$(dirname "$f")" before the unzip line. unzip "$f" -d "$(dirname "$f")"
Not the answer you're looking for? Browse other questions tagged finder automator zip . How to pass inputs to a shell script in automator?